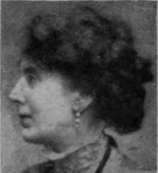 On January 11, 1909, Miss Charlotte Mansfield, the distinguished lady novelist, whose books. "Torn Lace," "The Girl and the Gods," and "Love and a Woman," have run into many editions, started from London for one of the most venturesome expeditions ever undertaken by a woman. Landing at Cape Town, she traversed Africa to Cairo, covering 16,728 miles in seven months. What is more, she accomplished this journey unaccompanied by any other white person. She took natives only with her, and travelled many hundreds of miles on foot or in a hammock slung on a pole carried by native bearers. She went out, to quote her own words, " as an independent writer and perhaps critic, without any axe to grind, or bias, only to see the country and write of it from a woman's point of view." She was treated everywhere with the greatest veneration, and she told with some amusement on her return how the people called her the "White Donna," and signalled with drums from village to village that she was on the road. On her return Miss Mansfield married Mr. Vladimir Raffalovich, a mining engineer of South Africa, in which country she has now made her home.